It was a defining moment for the stakeholders of the Peoples Democratic Party (PDP) as the Independent National Electoral Commission (INEC) on Tuesday formally broke its silence on the crisis and controversy rocking the opposition party and recognised the leadership of the National Caretaker Committee led by Senator Ahmed Makarfi. The decision on which of the leadership factions it would recognise became apparent following its acceptance of the candidate of the Makafi-led caretaker committee, Pastor Ize-Iyamu as the duly elected Edo State governorship candidate of the PDP. This action, thus, temporarily brought to an end, the raging controversy over which of the two contending factions (between Senator Makarfi and Senator Ali Modu Sheriff) can field candidates for elections. Buoyed by that confidence-boosting pronouncement by INEC, the National Caretaker Committee immediately convened a caucus meeting, where leaders of the PDP from all sides of the divide resolved to hold fresh national convention on August 17 to elect new officers of the party. To cap it all, the Governor of Rivers State, Nyesom Wike was given another chance to host the make or mar national convention in Port Harcourt, the Rivers State capital. One remarkable thing that happened at the national caucus meeting was the surprise appearance by a strong member of the Sheriff-led group and a chieftain of the PDP from the South-west, Senator Buruji Kashamu, who stormed the venue to declare his support for the Senator Makarfi-led National Caretaker Committee. While addressing journalists and other party stakeholders, who thronged the Shehu Yar’Adua Centre in Abuja, venue of the epoch-making caucus meeting, Chairman of the committee, Senator Makarfi said the party leaders had resolved to set aside the earlier zoning arrangements put together under the former national chairman. He said since the party had resolved that its next presidential candidate in 2019 will come from the north, the leaders in their wisdom also agreed that the national chairmanship position will now be zoned to the south. According to Makarfi, caretaker committee will within the next 48 hours constitute a zoning committee to further handle the zoning of other national offices in line with the constitution of party. 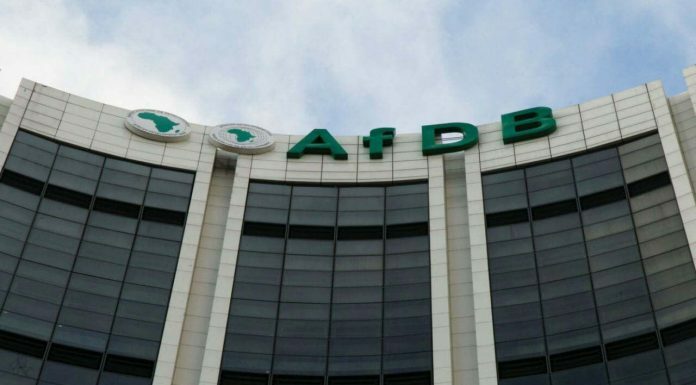 Makarfi also said the meeting resolved to propose four different amendments to the party’s constitution to align it with recent court judgments. And as the saying goes, “once beaten, twice shy”, PDP leaders did not need much prodding to unanimously agreed to amend the relevant sections of the party’s constitution in response to the recent court rulings, which voided the election of the former national chairman, Adamu Muazu in 2014. Though the court came handy to help resolve the party’s self-inflicted leadership crisis by sacking the recalcitrant Senator Sheriff and his group from office, the leaders also saw the court ruling as something that would have been very embarrassing if it had succeeded in keeping the party out of the Edo State governorship election. Speaking further on some of the resolutions reached at caucus meeting, Makarfi said the leaders considered and approved four amendments to the party’s constitution. “We have also discussed and agreed on a new amendment to the constitution in view of recent court judgments in order to align the constitution to the judgments that have been delivered by court of competent jurisdictions. Equally, we received reports of reconciliation. You can see by yourself, our brother, friend and associate, Senator Buruji Kashamu. “That is evidence of the reconciliation making progress and I can assure you that we will never foreclose full reconciliation with Senator Ali Modu Sheriff and other persons that may still be associated with him. What we want is an all-inclusive PDP – an equitable, fair and just system in the PDP, where the rights of everyone is protected and preserved. On the issue of fresh zoning arrangement, Makarfi said: “We also discussed about zoning. Within the next few days, a committee will be set up on zoning. The convention had set aside the previous zoning arrangement, so a new zoning arrangement has to be made. We have agreed that with the next 48 hours, this committee should be put in place and given a week to come out with a new zoning arrangement. Basking in the euphoria of the apparent progress at reuniting the party, the chairman of the Board of Trustees of the PDP, Senator Walid Jubrin also told journalists that as part of efforts at reconciliation, he and some other leaders of the party spent the better part of Wednesday night and up till 4amon Thursday morning discussing peace with the embattled former national chairman, Senator Sheriff. He reasoned that the fact that a member of the Sheriff’s camp and someone of Senator Buruji’s calibre has accepted to rejoin the mainstream PDP and support the caretaker committee is a clear sign that the crisis in the party was coming to an end. On the withdrawal of litigations in court and whether a lasting peace could be achieved before the August convention, Jibrin said: “What other kind of concession than for somebody to come on his own to announce that he is in support of the caretaker committee? We have been meeting with Sheriff up till 4am this morning. At the appropriate time, Sheriff himself will be with us,” he said. Among those who attended the meeting were governors Ayo Fayose (Ekiti), Nyesom Wike (Rivers), Ibrahim Dankwanbo (Gombe), Dairus Ishaku (Taraba), Dr. Olusegun Mimiko (Ondo), Deputy Senate President Ike Ekwerenmadu; Senators Andy Uba and Jonah Jang, Jerry Gana, Senator Adolph Wagbara, Tom Ikimi and Senator Atanatius Achaleonu. Others were former Governor of Niger State, Babangida Aliyu, Okwesilieze Nwodo, Uche Secondus, Prof. Rufai Akali, Bode George, Ambassador Aminu Wali, Amassador Wilberforce Juta, Senator Buruji Kashamu and Senator Ibrahim Mantu. As the party works a tight rope trying to shake off the leadership conflict that engulfed it following the coming of Senator Sheriff, another concern is already building-up on the fate of the Makarfi-led caretaker and whether they will indeed relinquish their office as planned. But Senator Makarfi seemed to be aware of such fear and has assured that his committee will definitely keep to the time frame allotted to it to organise a national convention and leave. He enjoined stakeholders of the party to reawaken the accommodating spirit with which the party was noted for in order to win more people over. While speaking yesterday when stakeholders of the PDP from Kwara State paid a courtesy call on the national caretaker committee, Makarfi said the recommended approach would help the party win more states in the 2019 general election. 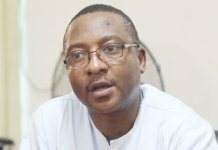 As the deadline for the submission of candidate’s name to the INEC for the Edo State governorship election came to a close last week Tuesday, anxiety gripped stakeholders overs fears that the PDP leadership tussle might eventually cost it the opportunity of fielding a candidate in the Edo State gubernatorial contest. Both parties to the conflict in the PDP had prepared for the worst having produced their governorship candidates and were set to summit same to the INEC that Tuesday in order to beat the deadline. So everyone was waiting to hear from INEC as the final arbiter under the circumstance. But it was the Makarfi-led PDP leadership that smiled in the end as INEC recognised its candidate, Pastor Osagie Ize-Iyamu and left the Sheriff’s camp in a near mourning mood. A late evening text message from the Deputy Director, Publicity and Voter Education of the commission, Mr Nick Dazang was all that was needed to put an end to the controversy. He said the commission has received names of 19 governorship candidates from 19 political parties, including the candidate of the PDP, Pastor Ize-Iyamu. The spokesman of the PDP caretaker committee, Dayo Adeyeye had earlier told journalists that the party had submitted the name of Ize-Iyamu as PDP candidate to the INEC for the Edo governorship election and that all was left in the hands of the commission to decide. Also, the Secretary of the committee, Senator Ben Obi confirmed that the name of the party’s candidate for the Edo State gubernatorial contest, Ize-Iyamu was submitted yesterday by the Markarfi-led leadership of the party. When asked about situation of things, Obi said, “Yes, we have submitted Pastor Ize-Iyamu’s name to the INEC and the commission received it today (Tuesday)”. It was gathered that INEC which has been applying the waiting game on the legal tussle between the feuding PDP leaders got swayed on Tuesday when it was handed the certified true copies of the various judgments that had ruled in favour of the Makarfi-led caretaker committee. A source within the ranks of the Sheriff faction, who did not want his name mentioned, confirmed to THISDAY yesterday evening that they had suffered a setback and that INEC has opted to recognise Ize-Iyamu as the PDP governorship candidate. Is Sheriff Still Holding Out? Barely 36 hours after the PDP zoned its national chairmanship to the South and declared it had not foreclosed full reconciliation with the Sheriff faction, the Sheriff group said yesterday that it had not reached any agreement with anybody. PDP had at its expanded national caucus meeting heard on Thursday in Abuja that the presence of Senator Buruji Kashamu, a strong supporter of the Sheriff faction was the evidence that its reconciliation effort was making progress. However, while speaking on the reconciliation at the weekend, Sheriff insisted that they are still pursuing their cases in court, adding that he would address a press conference on the state of the party on Monday. 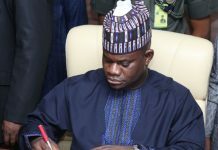 Sheriff did not speak directly but through his deputy, Dr. Cairo Ojougboh, but it was not clear whether the former governor of Borno State actually felt strongly about continuing with the struggle to retain his office. Ojuogboh said “I have the express permission of Sheriff to inform our teeming supporters and PDP faithful nationwide that he has not reached agreement with anybody, neither has he permitted anybody to conclude on any processes on his behalf. “We are continuing with our cases in court. We respect the rule of law. Sheriff will address a press conference on Monday on the state of our party, PDP. Our goal remains to return the party to the people and stamp out impunity. It was gathered that few days ago, some leaders of the party had met with Sheriff to find a lasting solution to the crisis bedeviling the party,” he said. However, in line with the spirit of reconciliation currently catching up with stakeholders, the PDP in the South-west at the weekend came close to resolving the intra party crisis rocking the zone. Notable leaders of the party, such as Governor Olusegun Mimiko of Ondo State, Governor Ayo Fayose of Ekiti State and Senator Buruji Kashamu met at the Ondo State Governor’s Lodge in Abuja, where they agreed to drop all their differences and to allow peace to reign. 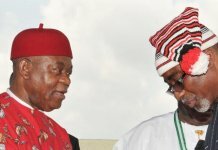 Among the resolutions reached at the peace meeting are that henceforth, none of the leaders should interfere in the affairs of any state apart from their home state and that the State Executive Committees as presently constituted and approved by the NEC before the botched National Convention in Port Harcourt, Rivers State, in Ogun, Ondo and Ekiti states should remain. Other decisions reached during the peace deal are that the State executives of the PDP in the three other states of Lagos, Oyo and Osun states will be harmonised and consolidated. It was further agreed that the leaders should always consult among themselves and work harmoniously together, going forward in order to ensure the peace, unity and progress of the people and party in the South-west.